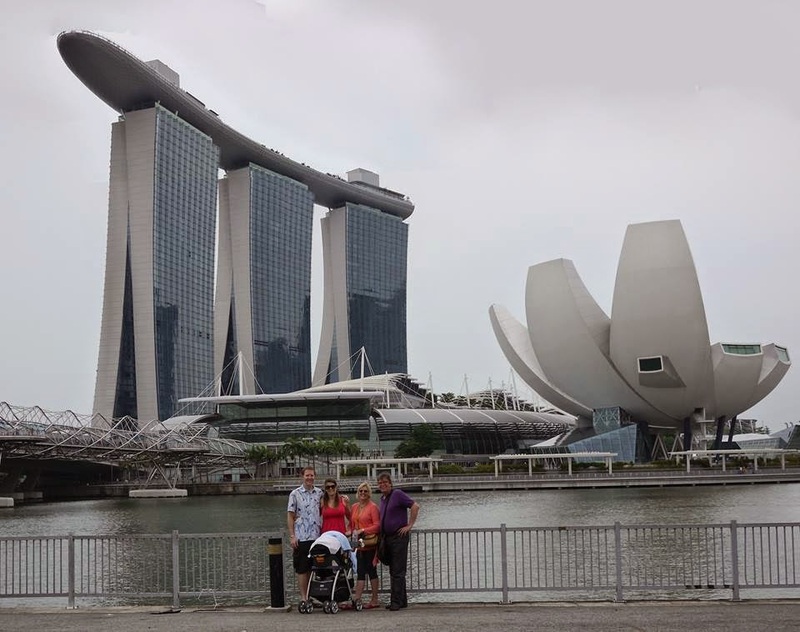 In October 2014 I spent a month in Singapore, visiting my daughter, son-in-law and granddaughter Viatrix. During these 4 weeks, I explored with my wife Annette Schiller the wine scene of Singapore, including German wine. During my 30 years career at the IMF, I visited Singapore from time to time; I knew my way around, when I came to Singapore this time. I have already released a number of postings about wine and food in Singapore based on my visit in October 2014. This posting summarizes my impressions with regard to German wine. The exchange rate at the time of my visit: S$1 = US$0.8. When Robert Parker stepped down as editor-in-chief of The Wine Advocate at the end of 2013, he took three investors from Singapore on board and appointed Singapore-based Lisa Perrotti-Brown as editor-in-chief. This was another sign that Singapore was on its way to becoming a major player in the world of wine. The restaurant, bar and club scene is amazing, ranging from inexpensive hawker centers to premium restaurants serving both eastern and western cuisine. Singapore covers just 700 square km and has a population of a bit more than 5 million people. It is a very expensive city (and became the most expensive city in 2014 according to the Economist) and also a popular tourist destination; on average every day, there are 36,000 additional people on the island. Traditionally, Singapore’s wine market has been dominated by French wine. The selection of Bordeaux and Bourgogne wines, including older vintages, in the large number of wine bars and restaurants in Singapore is amazing. Today, the interest is shifting to other red wine regions. “But more importantly, white wines are increasingly popular and after the Sauvignon Blanc boom, finally fine Rieslings or Grüner Veltliners are offered by the glass in some of the top restaurants” says Michael Thurner, who founded Austria’s Fine Brands in Singapore. According to the International Enterprise Singapore, a government agency, six countries account for more than 80% of import volume into Singapore. Australia and France are at the top with 31% and 26% of volume share, respectively, followed by Chile (9%), Italy (7%), US (6%) and New Zealand (6%). Spain, South Africa, Argentina and Germany each have approximately 3%. Who’s buying? With US55.000, Singapore has a high per capita income, higher than Germany and the US, for example. At several occasions during my recent stay in Singapore, I was referred to Magma German Wines, which, according to the Magma German Wines website, “is the main importer of German wine in Singapore.” Indeed, the Magma portfolio is very impressive, including about 30 German top producers. Tragically, Magma German Wines owner Leonardo G. Noto died in an accident in Germany in 2013 and it remains unclear if and how his wife Dagmar Noto will continue the business. When I was in Singapore, the web page was online, but there was no activity on the page in 2014. Also, Leonardo G. and Dagmar Noto’s well-known German wine bistro in Chinatown had closed and somebody else moved into the location. We will have to see and wait what happens. With Magma on the side lines, Wein & Vin, a small importer that specializes in German and French wines, owned and run by the charming Boon Seng Heng appears to have taken over the #1 spot: “We specially hand-pick some of the best wines in the world to include not only rare and collectible wines, but also good value-for-money wines.” The German portfolio comprises: Riesling wines (both dry and sweet) from Kesselstatt, Doennhoff (dry Rieslings) and Van Volxem and Spätburgunder (Pinot Noir) wines from Bernhard Huber, Meyer Nakel and Rudolf Fürst - all world class producers. Annette Schiller and I enjoyed at fabulous evening with Boon Seng Heng and Weingut Reichsgraf von Kesselstatt Rieslings at Taberna Wine Academy, a very special wine bar, off the beaten track. See also below. Weingut Robert Weil is represented in Singapore by Taste of Tradition (Importer and Distributor of Fine Wines Around the World). While I was in Singapore, Deputy Managing Director Jochen Becker-Köhn and Export Director Nicolas Pfaff of Weingut Robert Weil happened to stop by in Singapore. They had lined up a series of events at different location and I was able to join them on a couple of these events, including at Roosevelt's Diner and Bar. Pictures: At Roosevelt's Diner and Bar, playing Skat with Weingut Wilhelm Weil cards. Picture: Christian G.E. 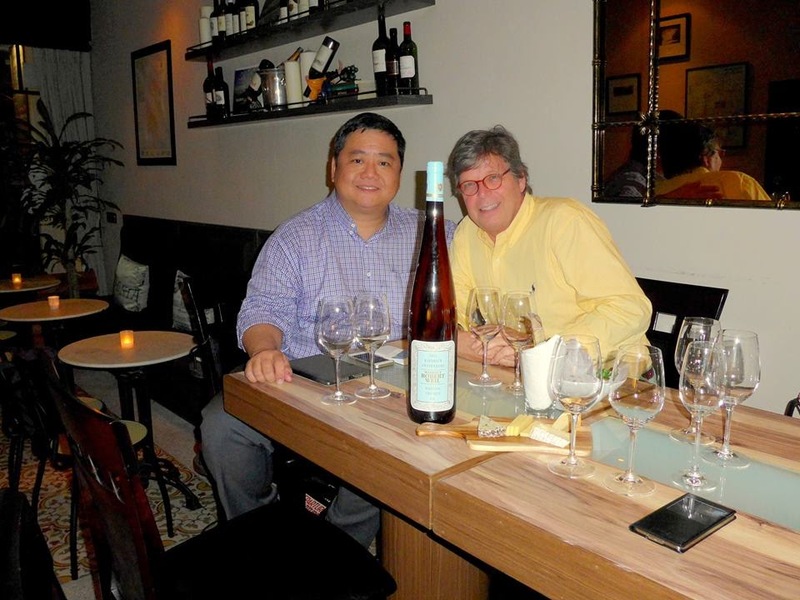 Schiller and Joe Chia of Taste of Tradition (Importer and Distributor of Fine Wines Around the World). At the recommendation of Christian Ress, Weingut Balthasar Ress, I had a glass of the Balthasar Ress Von Unserem at the oenotheque by Wine Universe. Located in a corner of Millenia Walk, the space incorporate a restaurant, a wine bar and retail-cellar. It is a joint venture by fourth-generation Swiss vintner, Dominique Giroud and Swiss owner, Claude Dizerens. Dominique is also the man behind Wine Universe, a leading wine retailer and brokerage in Switzerland. The portfolio of Wine Universe in Singapore includes one German producer that is Weingut Balthasar Ress. Currently, the Wine Universe offers 4 different wines of Weingut Balthasar Ress. From October 23 to October 26, 2014, over 70 wineries from all over the world presented their wines at the Singapore Wine Fiesta, the annual portfolio presentation of The Straits Wine Company. The wine fair was opened by a Winemakers’ Table Dinner on October 23, with the menu crafted by The Fullerton Bay Hotel Executive Chief Sandro Falbo. This was the seventh edition of Singapore Wine Fiesta. Straits Wine Company graciously invited me to the dinner. The Straints Wine Company: Started in 2006, The Straits Wine Company is now Southeast Asia’s leading wine importer, retailer and distributor, with operations in Singapore, Malaysia and Philippines. Offering a bespoke 360 wine solution, The Straits Wine Company has a comprehensive range of services that caters to any and all wine needs. From private wine parties to cellar planning, a trusted bottle shop to private client concierge, the Straits team of wine professionals is at your disposal. Our 12 retail wine bars across Singapore showcase a wide range of wines from around the world including Australia, New Zealand, France, Spain, Italy, Argentina, Portugal, India, USA, Lebanon, Japan, Switzerland and many, many more. Whether you are wine beginner or an experience aficionado, we have a wine for you. One German producer that was more often on our table (in the apartment) in Singapore than other producers was Weingut Selbach Oster. The main reason was that the Wine Connection store at Robertson Walk was very close to our apartment building and carried 2 Weingut Selbach Oster Riesling wines at a very reasonable price. In general, Wine Connection seems to pursue a business concept that is based on low prices (by Singapore standards). The Wine Connection bar next to the store was a fun place with a good selection of very reasonably priced wines - 100 wines by the bottle, starting at $40 and going up to $100. 30 wines by the glass, including 2 Weingut Selbach Oster wines. Always packed. There are now 5 Wine Connection bars in Singapore, including one focusing on cheese. Verre Wine Bar is one of my favorite wine bars in Singapore, right on the Singapore River, a bit outside of the center and an excellent selection of premium wines from Bourgogne and Bordeaux wines. The owner of Verre Wine Bar is an importer who also imports the wines of Weingut Forstmeister Geltz-Zilliken. Thedrinkbusiness.com: Boasting views over the Singapore river, the Verre wine bar offers a wide array of wines alongside a selection of meats and cheeses to compliment you choice. Verre is situated in a spacious, restored 19th century warehouse with floor to ceiling glass with the aim of bringing about the ambience of a modern French château. The world renowned Raffles Hotel does not offer any German wine at its Long Bar nor in its various restaurants. This is the best selection of German wines at the Marina Bay Sands Hotel Complex. No wines by the glass, no food, but an extraordinary wine list, including a sensational selection of German wines. The wine bar is owned and run by, Tan Ying Hsien, who is enrolled (and pretty advanced as far as I know) in the Master of Wine program.